On the morning of May 5, 2010, nobody could say for sure how much fluid had leaked from the 650,000-gallon disposal pit near a natural gas drill pad in Shippen Township, Penn. — not the employees on site; not the farmers who own the property; not the DEP rep who came to investigate. But there were signs of trouble: Vegetation had died in a 30’ by 40’ patch of pasture nearby. A “wet area” of indeterminate toxicity had crept out about 200 feet, its puddles shimmering with an oily iridescence. 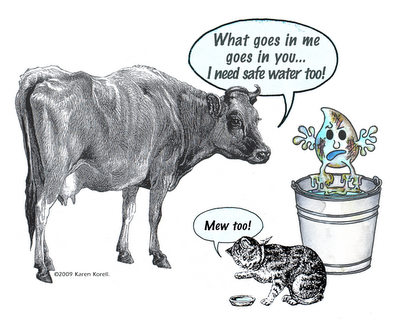 And the cattle: 16 cows, four heifers and eight calves were all found near water containing the heavy metal strontium. Strontium is preferentially deposited in cows’ bones at varying levels depending on things like age and growth rates. Since slaughtering 28 cattle on mere suspicion can devastate a farmer financially, nobody knows what, if anything, the cows ingested. They’re now sitting in quarantine. The Shippen Township incident isn’t the first time hydraulic fracturing, a controversial gas extraction technique that involves shooting water, sand and a mix of chemicals into the ground to release gas, has been blamed for livestock damage. But for farmers in the northeast whose land sits atop the gas-rich Marcellus Shale formation, it is a wake-up call – an event that raises questions about fracking’s compatibility with food production. “I’ve already heard from a couple of customers that they’re concerned about the location of a drill site near my farm – in terms of the quality and safety of my food,” said Greg Swartz, a farmer in Pennsylvania’s Upper Delaware River Valley. Swartz, who sells all his products locally, fears that leaked fracking fluid could seep into his soil, bioaccumulate in his plants and cost him his organic certification. “There very well may be a point where I am not comfortable selling vegetables from the farm anymore because I’m concerned about water and air contamination issues,” he said. Air contamination – specifically the production of ozone – is what worries Ken Jaffe, another farmer in Meredith, NY. When excess methane gas, coupled with volatile compounds like benzene, toluene and xylene, are released into the air in a process the gas industry calls “venting,” it can inhibit lung function and wreak havoc on plant life. In Sublette County, WY, fracking has been blamed for ozone levels that are comparable to those in Los Angeles. Over the past two years, horizontal hydraulic fracturing has garnered a lot of attention. Advocates of the practice believe the staggeringly high amounts of gas it makes accessible could serve as a “cleaner-burning” bridge between fossil fuels and renewable energy sources. But critics blame fracking for a whole range of problems — house explosions, flammable drinking water, chronic sickness, crop failure and air contamination, to name a few. In 2005, the Bush administration introduced the Energy Policy Act, which exempted hydraulic fracturing from several key environmental regulations, including parts of the Clean Water Act and CERCLA (Superfund). Since then, drilling operations (along with corresponding environmental problems) have begun to extend like spiderwebs across states like Colorado, Wyoming, Texas, and Pennsylvania. For all their concerns, farmers like Swartz and Jaffe comprise only one side of a larger debate over drilling. Leasing one’s land, after all, carries the promise of a comfortable retirement — sometimes even millions of dollars. And with milk prices making small-scale dairy operations harder and harder to maintain, many farmers are looking for the light at the end of the pipeline. Some have found it. According to one Penn State study, Pennsylvania made a $2.95 billion profit from drilling in 2008 alone; the state also gained 53,000 new jobs. And in the Windsor/Deposit area of New York, 300 property owners have signed a lease with XTO Energy that covers 37,000 acres and is worth $90 million (notably, the lease contains a provision that indemnifies drillers against damage to livestock). Though New York is still waiting on its Department of Environmental Conservation for the go-ahead to start horizontal drilling, much of the state’s topography has already been carved, cordoned and auctioned off to eager gas companies. Gas drilling raises a lot of questions for farmers short on options. Is it worth the risk to retire comfortably? What are the implications for future use of the land? Perhaps most importantly: How does fracking affect crops, livestock and, by extension, the people who consume them? Answers are scarce. “There’s a lot going on out there and we don’t know most of it,” Swartz said. Scientists, too, are grappling for information. Though there exists an increasingly comprehensive catalog of knowledge about water problems related to fracking, little work has been done to determine how the practice affects animals and crops. “I see very little research being done on cows,” said Theo Colborn, founder of the non-profit Endocrine Disruption Exchange. Because animal testing with many chemicals known to be involved in fracking has historically failed to deal with instances of a) limited exposure and b) prolonged exposure, no one really knows what the potential health effects are – for cows or humans. Certainly not the federal EPA. Earlier this year, it announced plans to launch a two-year study of hydraulic fracturing’s effects on water. According to an EPA spokesperson, no part of that study will deal with plants or animals. And yet, there is significant anecdotal evidence that suggests fracking can seriously compromise food. In April 2009, 19 head of cattle dropped dead after ingesting an unknown substance near a gas drilling rig in northern Louisiana. Seven months before that, a tomato farmer in Avella, Penn. reported a series of problems with the water and soil on his property after drilling started: he found arsenic levels 2,600 times what is recommended, as well as dangerously high levels of benzene and naphthalene – all known fracking components. And in May 2009, one farmer in Clearview, Penn. told Reuters he thought that gas drilling operations had killed four of his cows. Occurrences like these aren’t just limited to the eastern U.S. In Colorado, a veterinarian named Elizabeth Chandler has documented numerous fertility problems in livestock near active drill sites, including false pregnancy, smaller litters and stillbirths in goats; reduced birth rates in hogs; and delayed heat cycles in dogs. In another case, Rick Roles, a resident of Rifle, Colorado, reported that his horses became sterile after three disposal pits were installed near his home. Like those in Chandler’s study, Roles’ goats began yielding fewer offspring and producing more stillbirths. Roles himself suffered from swelling of the hands, numbness and body pain – symptoms, he said, that subsided when he stopped eating vegetables from his garden and drinking his goats’ milk. Actual scientific studies are few and far between, but what’s out there paints a pretty damning picture. One, titled “Livestock Poisoning from Oil Field Drilling Fluids, Muds and Additives,” appeared in the journal Veterinary & Human Toxicology in 1991. It examined seven instances where oil and gas wells had poisoned and/or killed livestock. In one such case, green liquid was found leaking from a tank near a gas well site. The study’s authors found 13 dead cows, whose “postmortem blood was chocolate-brown in color.” Poisoning cases involving carbon disulfide, turpentine, toluene, xylene, ethylene, and complex solvent mixtures “are frequently encountered,” the study concluded. Environmental groups have a markedly different perspective on the issue. “There’s a lot of violations that happen out there that are never documented,” said Wes Gillingham, program director of Catskill Mountainkeeper. So what sorts of concerns should people have about eating animals that have themselves ingested xylene, benzene, heavy metals, radioactive material? Gillingham, like so many farmers, federal officials and industry reps, can’t say for sure. Is any harm being done by this marketing ploy? After all, some might say consumers are at least getting some vitamins, and there isn’t as much sugar in vitaminwater as there is in regular Coke. True. But about 35 percent of Americans are now considered medically obese. Two-thirds of Americans are overweight. Health experts tend to disagree about almost everything, but they all concur that added sugars play a key role in the obesity epidemic, a problem that now leads to more medical costs than smoking. How many people with weight problems have consumed products like vitaminwater in the mistaken belief that the product was nutritionally positive and carried no caloric consequences? 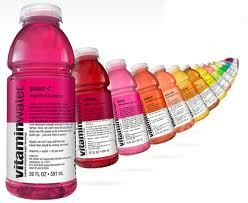 How many have thought that consuming vitaminwater was a smart choice from a weight-loss perspective? The very name “vitaminwater” suggests that the product is simply water with added nutrients, disguising the fact that it’s actually full of added sugar. The truth is that when it comes to weight loss, what you drink may be even more important than what you eat. Americans now get nearly 25 percent of their calories from liquids. In 2009, researchers at the Johns Hopkins Bloomberg School of Public Health published a report in the American Journal of Clinical Nutrition, finding that the quickest and most reliable way to lose weight is to cut down on liquid calorie consumption. And the best way to do that is to reduce or eliminate beverages that contain added sugar. Meanwhile, Coca-Cola has invested billions of dollars in its vitaminwater line, paying basketball stars, including Kobe Bryant and Lebron James, to appear in ads that emphatically state that these products are a healthy way for consumers to hydrate. When Lebron James held his much ballyhooed TV special to announce his decision to join the Miami Heat, many corporations paid millions in an attempt to capitalize on the event. But it was vitaminwater that had the most prominent role throughout the show. I still can’t get over the bizarre audacity of Coke’s legal case. Forced to defend themselves in court, they are acknowledging that vitaminwater isn’t a healthy product. But they are arguing that advertising it as such isn’t false advertising, because no could possibly believe such a ridiculous claim. Why do we allow companies like Coca-Cola to tell us that drinking a bottle of sugar water with a few added water-soluble vitamins is a legitimate way to meet our nutritional needs? Here’s what I suggest: If you’re looking for a healthy and far less expensive way to hydrate, try drinking water. If you want to flavor the water you drink, try adding the juice of a lemon and a small amount of honey or maple syrup to a quart of water. Another alternative is to mix one part lemonade or fruit juice to three or four parts water. Or drink green tea, hot or chilled, adding lemon and a small amount of sweetener if you like. If you want to jazz it up, try one-half fruit juice, one-half carbonated water. If your tap water tastes bad or you suspect it might contain lead or other contaminants, get a water filter that fits under the sink or attaches to the tap. And it’s probably not the best idea to rely on a soft drink company for your vitamins and other essential nutrients. A plant-strong diet with lots of vegetables and fruits will provide you with what you need far more reliably, far more consistently — and far more honestly. Oldspeak: “Researchers worry that constant digital stimulation creates attention problems for children with brains that are still developing, who already struggle to set priorities and resist impulses…the ultimate risk of heavy technology use is that it diminishes empathy by limiting how much people engage with one another, even in the same room….The way we become more human is by paying attention to each other” Hmm… could our obsession with technology be helping to drive skyrocketing use of ADHD and other psychatric meds with children? While whittling away at our ability to intereact with each other face to face sans technology? Connor’s troubles started late last year. He could not focus on homework. No wonder, perhaps. On his bedroom desk sit two monitors, one with his music collection, one withFacebook and Reddit, a social site with news links that he and his father love. His iPhone availed him to relentless texting with his girlfriend.